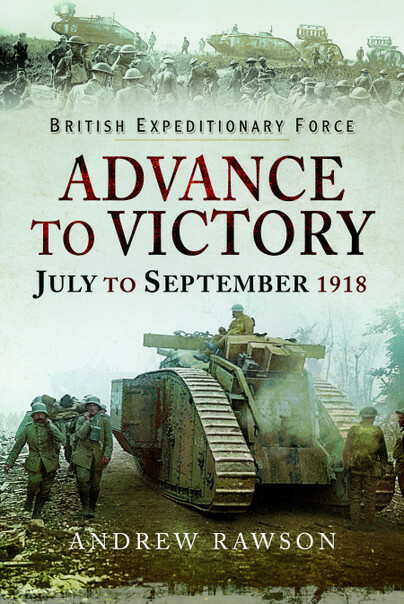 You'll be £11.99 closer to your next £10.00 credit when you purchase British Expeditionary Force - Advance to Victory. What's this? This is the story of the British Expeditionary Force’s part in the opening days of the Advance to Victory. It starts with the contribution to the Battle of Fère-en-Tardenois in July; the counter-offensive which pushed the Germans back to the River Marne. Fourth Army’s attack on 8 August was called the Black Day of the German Army, but it was only the beginning of 100 days of campaigning. The narrative follows the advance as it expands across the Somme, the Artois and the Flanders regions. Time and again the British and Empire troops used well-developed combined arms tactics to break through successive lines of defence. By the end of September, all five of the BEF’s armies had reached the Hindenburg Line and were poised for the final advance. Each stage of the two month battle is given the same treatment, covering the details of the most talked about side of the campaign; the BEF’s side. Over fifty new maps chart the day by day progress of the five armies and together with the narrative, explain the British Army’s experience during the opening stages of the Advance to Victory. The men who made a difference are mentioned; those who led the advances, those who stopped the counter-attacks and those who were awarded the Victoria Cross. Discover the beginning of the Advance to Victory and learn how the British Army had mastered the art of attack. Over fifty new maps chart the day by day progress of the five armies and together with the narrative, explain the British Army's experience during the opening stages of the Advance to Victory. The men who made a difference are mentioned; those who led the advances, those who stopped the counter-attacks and those who were awarded the Victoria Cross. Discover the beginning of the Advance to Victory and learn how the British Army had mastered the art of attack. Over fifty new maps chart the day by day progress of the five armies and together with the narrative, explain the British Army’s experience during the opening stages of the Advance to Victory. The men who made a difference are mentioned; those who led the advances, those who stopped the counter-attacks and those who were awarded the Victoria Cross. Discover the beginning of the Advance to Victory and learn how the British Army had mastered the art of attack. This author continues to provide excellent coverage of the British Expeditionary Force's campaigns on the Western Front. Combined, his books provide an excellent record of the military story in Western Europe, broken down by Corps, Division and Battalion. His books a clearly written, straightforwardly set out and structured, whilst provide wonderful one-stop guides to the Battlefields. This author is to be applauded for his determination to present so many maps.